The Edith J. Carrier Arboretum is a 125-acre botanical preserve located within the city limits of Harrisonburg on the campus of James Madison University. There are between three and four miles of interconnecting trails through the arboretum. (Maps) Spring is a fabulous time to visit this special spot and witness flowers opening and the forest coming back to life again! 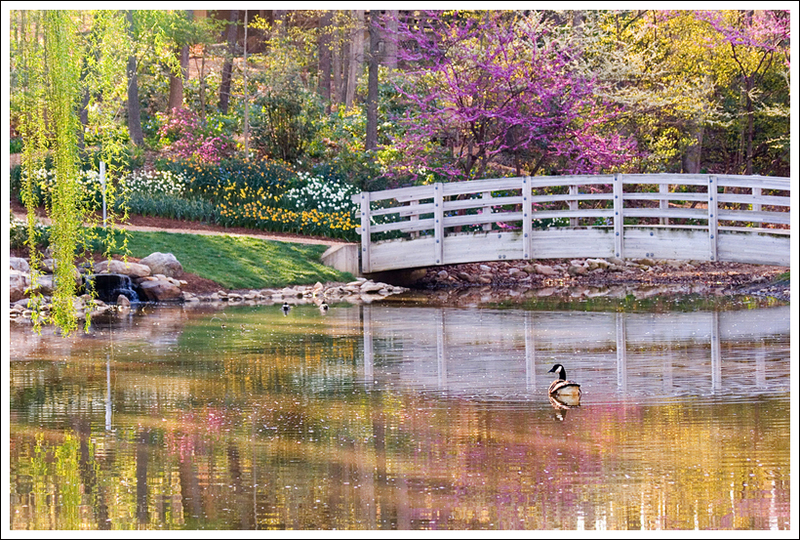 Spring is a gorgeous time of year to visit the Edith J. Carrier Arboretum. 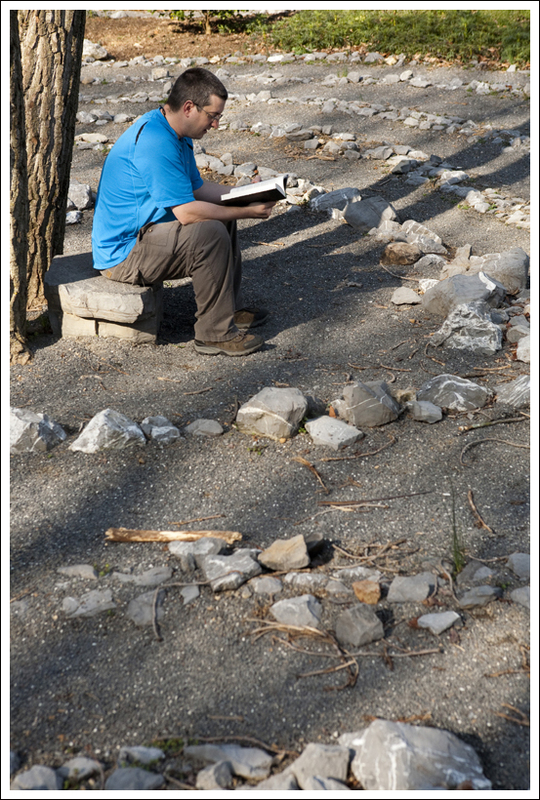 Below: The paths in the arboretum are all well-maintained; Adam hunts down a geocache; Enjoying the labyrinth. 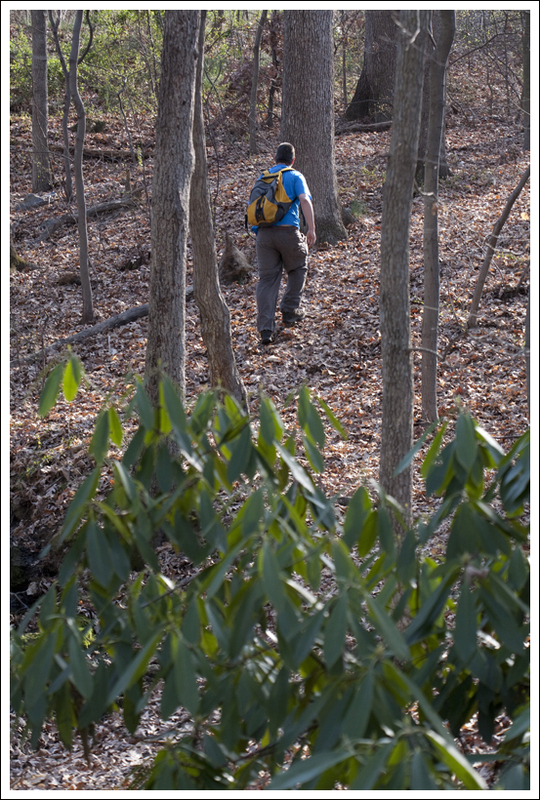 What do you do on a morning you want to get out into nature, but you don’t have time for a longer hike in the national forest or Shenandoah National Park? 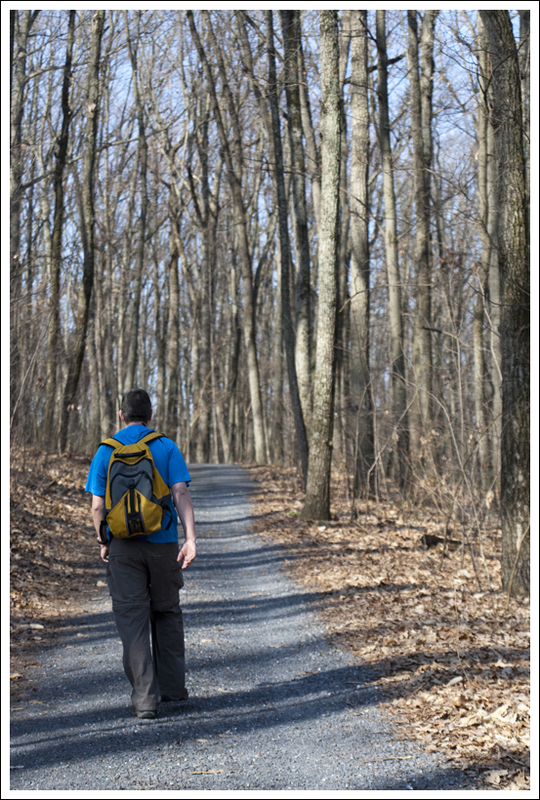 If you’re anywhere near Harrisonburg… you go to the Arboretum. It’s a beautiful, lush, wooded spot in the middle of Harrisonburg. Trails covered with wood chips or gravel wind their way through the forest. There are two ponds where you can spot ducks — usually mallards, but sometimes wood ducks if you’re lucky. Squirrels crunch through the understory, woodchucks duck into holes when they hear approaching footsteps and birds sing in the trees overhead. There are even a few hawks that call the Arboretum home, so be on the lookout for them! Beyond the wildlife, the Arboretum has abundant plant life – both wild natives and cultivated species. In the spring, flowering trees – redbuds, dogwoods and magnolias – burst with color. 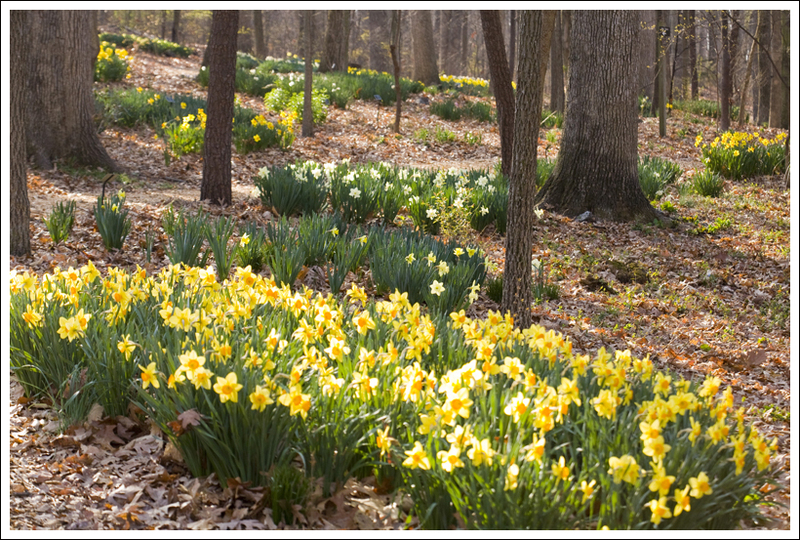 One section of the trail passes through an area populated by hundreds of daffodils. Bleeding hearts bloom in quiet corners. 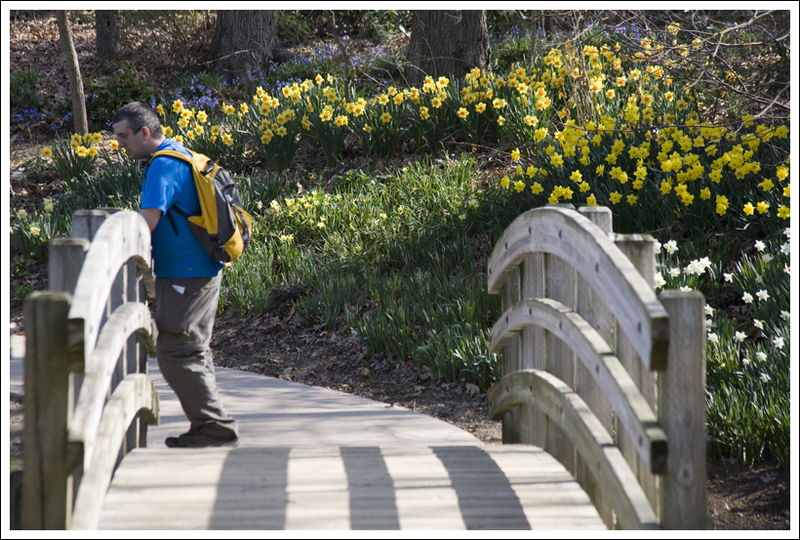 Trillium, Virginia bluebells, snowdrops, hellebore and even some yellow lady slippers can be found along the paths. There is always something new and different blooming, so it’s a place we visit time and time again. Daffodils are abundant and impressive at their peak! Below: Adam checks out the arboretum map. On this particular morning, Adam and I hiked the path along the perimeter of the arboretum. We walked through the daffodils, passed the quiet, smaller pond near the greenhouse and then climbed into the natural wooded section. On the return half of the walk, we stopped at the labyrinth and spent a little time walking the maze. All in all, we walked about two miles. We could have walked more if we had taken all of the side paths and connectors, but on this morning, two miles was enough. It was a beautiful morning! Take a moment to stop by the arboretum’s Flickr site to view hundreds of photos from their grounds! This should probably be listed as a “hike” with the quotation marks since it is more of a walk through a nice arboretum. We do like to cover hikes for all different types of abilities and this should be one that most people can do. There is even a wheelchair-access ramp down to the pond, so anyone can enjoy this. You will likely see several families here on pretty days by the lake or perhaps see some wedding or family photos taking place nearby. This is a place to stroll through and enjoy the scenery. 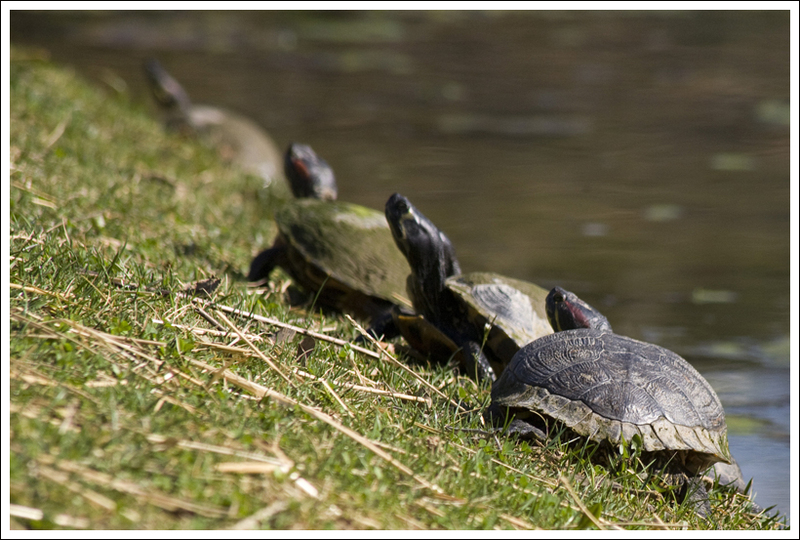 Turtles can usually be spotted basking in the sun. 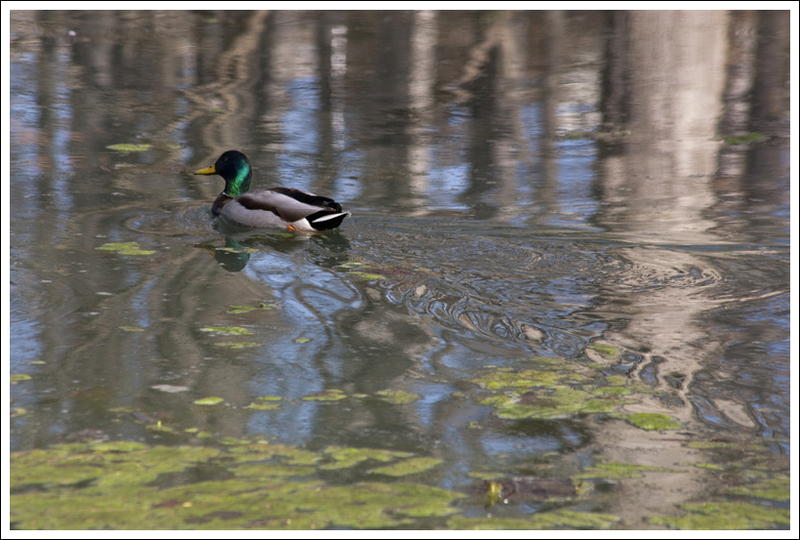 Below: A mallard swims in the pond. One thing that is exceptional here is all the beautiful flowers. At this time of year, everywhere you turn your head you’ll be greeted with vibrant colors from the blooming trees and flowers. You can read more about the history and flora on their website. There are probably a few key highlights of the arboretum. The most prominent is the pond. You will most likely see mallards floating on top and a coin-operated machine to purchase feed for the ducks. At certain times of the year, there is also a poet-tree where the Arboretum hangs a wicker basket. People are invited to write a poem and leave it there for others to read. Another highlight is the rock labyrinth that is located off a trail. While it is not a labyrinth created to the level that you may have seen in The Shining, it is a path made with rocks in the ground that produces a zen-like rock garden feel. We started from the northern parking lot and made the large loop around the perimeter of the park, starting near the picnic pavilion. The end of the perimeter loop brought us by the education center, to the lake, and back to the parking lot. We then walked around the upper terrace Caroline Sinclair Memorial Garden. With everything blooming typically in April-June this is a great place to visit in the spring! Adam enjoys a view of the pond from the bridge. You can download a map of the Arboretum here. 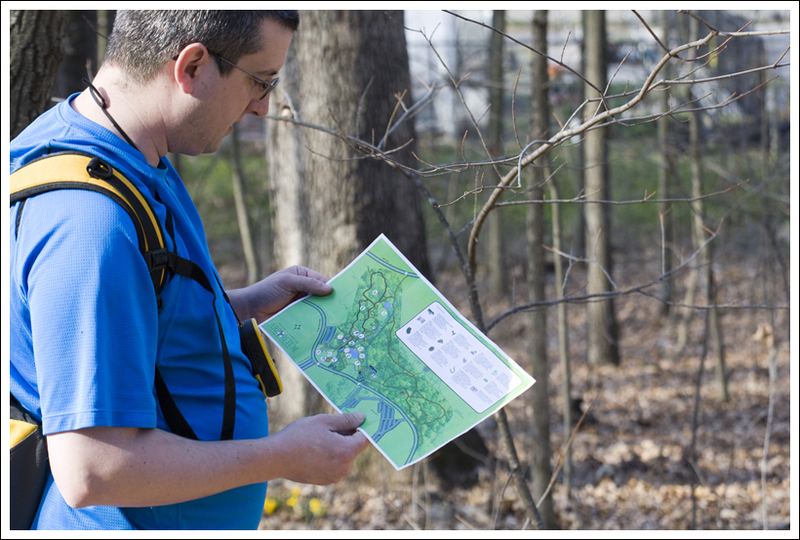 If you are interested in geocaching, there are also several geocaches here in the Arboretum. This might be another thing to enjoy as a family here. Distance – 1.7 miles for the long path around, but it can vary based on how far you want to explore the side trails inside. Difficulty – 1. These gentle paths can be walked by nearly anyone. There is even an accessible path around the main pond. Views – 0. This is a wooded walk, so there are no views. Streams/Waterfalls –3. There are two ponds, a small man-made waterfall and a pretty stream passing through. Wildlife – 3. Many bird species and small mammals. Occasionally deer are spotted. Ease to Navigate – 5. All the paths interconnect and lead back to the center hub. Solitude – 0. This arboretum is very popular! Directions to trailhead: The best way to get directions is using the website google directions here. Thanks so much for blogging and photographing your visit to the Edith J. Carrier Arboretum at JMU!. If The arboretum staff love reading visitor comments and reflections.